Even though Julien Tavernier (Maurice Ronet) knows that killing another human being is the most serious of crimes there is he is willing to take his chances. On the phone his beautiful lover Florence Carala (Jeanne Moreau) will whisper Je t'aime, je t'aime and that is enough for Julien to do what a man madly in love must do: kill her husband. In the building where Julien works many admire his manners. Julien is always nicely dressed, his hair combed, his suit is always ironed. He drives a beautiful automobile where at night his lips would kiss Florence Carala's face. Julien can hardly wait for the day when he and Florence will no longer have to hide their love. And so Julien heads to Monsieur Carala's (Jean Wall) office prepared to discuss a delicate business deal. His boss, always fond of Julien's bright ideas, invites the young man to have a seat. Julien hands Monsieur Carala a tiny folder, looks at him, and then shoots the man who has been keeping him away from Florence in the heart. In a nearby café Florence awaits her lover to arrive. Visibly excited, his heart racing, his future already planned, Julien can hardly even walk. He is only minutes away from the soft lips of his beloved Florence. He could almost feel her heavy breath, her long curly hair, her hands reaching out for him. Julien gets in his car, turns the engine on, and takes one final look at the building where a dead man is now awaiting to be found. But…Julien can hardly believe his eyes: there is a piece of rope hanging from Monsieur Carala's balcony. Stupid, o, how stupid, only an amateur could do such a childish mistake!! He throws his coat on the passenger's seat and runs back to the building. Julien must take the piece of rope and hide it away. And he must do so quickly, before the night guard turns off the electricity and locks the empty building. Julien reaches for the elevator's door. 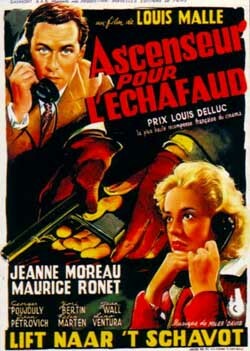 Ascenseur pour l'échafaud a.k.a Elevator to the Gallows (1958) is a film that like so many other French crime thrillers from the early 1950's did not quite fit the noir bill which the early 1940s mastered to perfection. While the story and the characters were somewhat familiar they were all intertwined together in a mix that anything but reflected the well-established crime-formula from the period. Elevator to the Gallows was more of a transition picture that flagged the emergence of the French Nouvelle Vague while at the same time remained quite restrained in both style and presentation. Compared to the works of Goddard, Truffault, and Rivette the film was still a student willing to learn as quickly as possible. Directed by Louis Malle who once worked as a camera man for the famous Jacques Cousteau Elevator to the Gallows signaled the beginning of an era where the hand-held camera would be more and more often used to unveil that unique "realistic" look a generation of French directors will immortalize with their films. Complimented with one of the most stylish soundtracks ever composed this film also managed to infuse the slick jazzy tunes of Miles Davis like no other film I have ever seen. For me the soundtrack alone was a good enough reason to regard Elevator to the Gallows as a classic amongst classics. With the sea of admirers during the years Louis Malle's film also created plenty of critics who never understood the importance of Jeanne Moreau's character. Florence Carala was seen by many as too detached from the story bearing little, if any, relevance to Julien's struggles. I must admit that, like so many others, I also entertained quite a few ideas where Elevator to the Gallows remained true to the classic noir formula providing a stylish but predictable finale - I am not so sure I would have liked the film as much as I do these days. The twin-stories Louis Malle provided may not be the easiest ones to agree with but they surely unveiled an edgy look that separated Elevator to the Gallows from everything else French directors filmed at the time. In 1957 Elevator to the Gallows won the prestigious Prix Louis Delluc (Louis Malle) granted by the French Film Industry. How Does the Film Look? Presented in its original aspect ratio of 1.66:1 and enhanced for widescreen TV's the print herein reviewed reveals the typical for Criterion high-quality treatment: a great progressive transfer, excellent degree of contrast, a near perfect detail, deep and lush tone colors (blacks are especially well-reproduced), and an overall tight image that looks exceptionally well when blown out through a digital projector. With all of this said however I did notice a few dust specs here and there (especially in the opening scenes) that have me a bit puzzled. Criterion are typically flawless when it comes to digital restoration and I am led to assume that perhaps these were marks that were imbedded in the actual print and could not be removed. Before anyone starts making unfounded conclusions I want to clarify that these are very minor specs that will surely create no response from less pretentious viewers. Yet, considering the fact there is an entire community of dedicated film fans that would want to know everything in terms of technical presentation/restoration I decided to point those out. All things considered however this is one exceptionally good looking DVD that should rightfully be added to the excellent boxset of Louis Malle films Criterion released earlier this year. How Does the Film Sound? Presented with its original French Mono track and optional white subtitles this is the area where this DVD by Criterion absolutely shines. The marvelous score by Miles Davis comes off the speakers in a way that must be heard to be believed. Crisp and clear this audio presentation by Criterion is a joy to listen to. I am unsure what the state of this film was prior to digital restoration but this is clearly one of the best jobs Criterion have done in quite a long time and I am utterly impressed. Bravo! Before we address the extras provided with this double set by Criterion allow me to point out the fact that I am very disappointed with this new double case that the company has used for Elevator to the Gallows. Most of you have probably seen this new design where the two discs overlap each other thus the disc on the top must be removed each time one wants to access the disc on the bottom. This is a very unfriendly double case which will produce plenty of anger amongst those (me included) who found nothing wrong with the classic cases Criterion used up to this point. On disc one you will find two trailers to the film: the original trailer and a second trailer for Janus Films which I found much more stylish and classy than the original one. Thank you Criterion for providing it with this package! On disc two you will find a new interview with Jeanne Moreau which was specifically recorded for this DVD release in Brasserie La Lorraine in Paris (2005). The interview is entirely in English (takes place in a high-end bistro) and Jeanne Moreau speaks about her first encounter with Louis Malle, the script to the film, and how she was approached and consequently offered the role of Florence Carala. Next, there is an interview with Louis Malle that dates back to 1975 where while working on his Black Moon the director was interviewed by a Canadian TV crew regarding his directorial debut. The interview uses plenty of archive footage and is offered in French with white English subtitles. Next, there is the "Malle and Moreau at Cannes" interview which was shot during the 1993 Cannes Film Festival specifically for the French TV program Le Circle de Minuit. This is probably one of the most curious extras on this set as it shows Malle and Moreau recalling their early work in a purely improvised manner. Next, there is an extensive extra on Maurice Ronet, prior to his leading role as Julien, that was recorded for the French TV program Reflets de Cannes in 1957. This is a great interview (a pretty old at that) that sheds a great deal of light on this most prolific French actor whose body of work contains more than 100 films. Next, there is a terrific piece of extra titled "The Miles Davis Score" divided in three sections where we first see Miles Davis playing his trumpet while Elevator to the Gallows is being shown on a big white canvas. Superb!! Next, there is an interview with the French pianist Rene Urtreger where he recalls his work with Miles Davis and how he was invited to record the soundtrack to the film. At the end there is "Miles Davis Goes Modal" in which jazz trumpeter Jon Faddis and film critic Gary Giddins discuss Miles' work and his contribution to the film. Last but not least there is the little seen Louis Malle student picture Crazeologie which dates back to 1954 inspired by the works of Samuel Beckett and Eugene Ionesco (the film is also complimented by the music of Charlie Parker). Another spectacular package by the always reliable Criterion with plenty of extras (and more than enough of extras that pertain to the famous score of this film) which should be a mandatory addition for those of you that already own the spectacular Louis Malle boxset!! This is a must-buy folks, it is as simple as that!! HIGHLY RECOMMENDED!